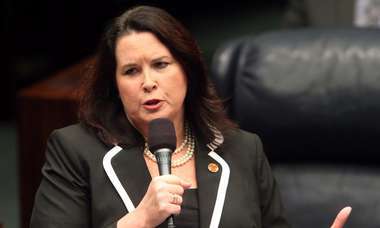 Aids Healthcare Foundation filed a lawsuit accusing the Republican governor of violating the Florida public records law. Gov. Rick Scott greets supporters at a campaign rally June 26, 2018. Credit: Kirby Wilson, Tampa Bay Times. A not-for-profit health care company that lost a bid to renew its Medicaid contract with the state had a question for Gov. Rick Scott: Where can we find you? They asked his staff to send them a copy of his schedule — in the office and on the campaign trail — for the next three months so they could talk to him about their concerns. They argued that documents, compiled and recorded by taxpayer-paid staff and followed by the state's top executive, his security entourage and other people on the state payroll, are public record and ought to be available for anyone in the state to see. But the governor's office wouldn't turn them over, claiming the calendars — even those already sent to the public — are exempt from public disclosure. 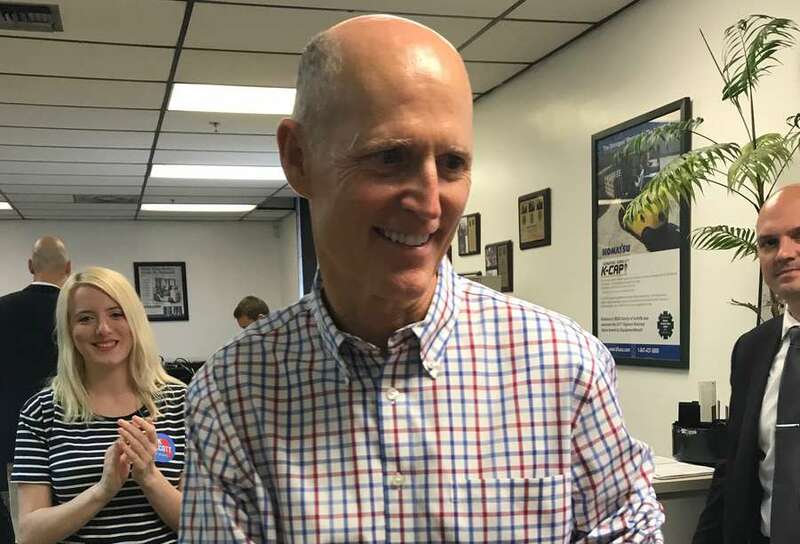 On Thursday, Aids Healthcare Foundation filed a lawsuit against Scott, accusing the Republican governor of violating the Florida public records law. They are asking the Leon County Circuit Court to order him to produce the records or, at least, review the records behind closed doors to determine whether the governor is right to keep them exempt. "We have a right to know: Is he meeting with pharmaceutical companies, with for-profit insurance companies? Is he out playing golf, or is he representing the people?'' asked Imara Canady, spokesman for the Aids Healthcare Foundation which operates the Florida health care provider that lost the bid to renew its contract. "From where we stand, this is not an unfair request." Scott, the two-term governor who is now running for U.S. Senate, routinely offers fewer details on his public schedules than the three governors who preceded him. There are vast stretches of time in his daily public calendar that are not documented. He frequently lists "work and call time" on his public calendar, but he rarely provides details about who he is working with or calling. Public record requests for copies of his more detailed calendars, sought after the fact, are heavily redacted and often take months to obtain. AHF is a not-for-profit health plan that serves thousands of HIV/AIDS patients in Miami-Dade and Broward counties through the state's Medicaid managed care plan. Its contract, which began in 2013, expires at the end of 2018 and was valued at over $800 million over five years. In April, AHF lost its bid to renew it when the state awarded the contract in Miami-Dade and Broward to a for-profit arm of the Blue Cross/Blue Shield corporation. AHF, which operates under the name PHC Florida HIV/AIDS Specialty Plan, filed a bid protest and has a hearing scheduled for Aug. 7 before the Department of Administrative Hearings. The company argues that by not selecting them as an option for patients, the state "threatens to disrupt the care of thousands of people living with HIV/AIDS at a time when Florida continues to pull back on other resources devoted to combating this problem." "We're not saying they shouldn't contract with the other plan, but they shouldn't cut us out of the process,'' said Jeffrey Bland, AHF's assistant general counsel. "We are a long-standing provider with particular experience in providing this kind of care to people with HIV, and it's a terrible disruption for our members to have their plan pulled out for no good reason." Miami-Dade and Broward are at the "epicenter of the nation's HIV epidemic" and it has "gotten worse during Scott's term,'' Canady said. AHF wants its advocates and patients to be able "to let the governor hear not just from our staff but the people impacted by him and his team" that the decision could be disruptive to many fragile patients who must now find new doctors, he said. The company asked the governor's office for a series of public records, including those "showing meetings and travel plans involving Governor Scott for the period July 20, 2018 through October 31, 2018." It asked for all electronic and hard copies of calendars "showing all meetings, events, and appearances involving the governor." And it asked for Scott's future travel plans, where he will reside and "a list of all campaign and fundraising events Governor Scott will attend as part of his campaign for U.S. Senate." Scott's office refused. It cited the public records law and as simply the office is "unable to provide these records at this time as they are exempt pursuant to 119.071(2)(d) F.S." AHF contends the response violated the law on several counts and also doesn't make sense. Scott's office "failed to explain how its cited exemption was applicable, especially in light of the fact that the governor's schedule is a public record, has been produced previously before, and is typically emailed out to the public and press on a daily basis,'' states the lawsuit. Scott not only does not release many details about how he spends his day as governor, his campaign also provides few advanced details about where he will be while campaigning. He excludes from the public schedule meetings with lobbyists and their clients and rarely, if ever, acknowledges fundraisers. Previous governors released their schedules the day ahead. Scott's office releases his schedule hours into the day, occasionally releasing an updated version of the schedule to highlight a last-minute addition but usually after the event occurred. Scott travels at his own expense on a Cessna Citation Excel purchased in 2013 by the company controlled by Scott's wife, Columbia Collier Properties. Because of his lack of disclosure, there is no way to know if Scott invites campaign staff, lobbyists or others on his plane or travels with other elected officials. When he arrives in a city and has unscheduled time, Scott has been known to call lobbyists and ask to meet with them or their clients. His schedule is not updated to reflect those meetings. "In trying to ascertain where Gov Scott is, it is has been nearly impossible,'' Canady said. "There is no public record of his actual schedule. No public indication of where he's going — except post-dated reports of where he's been … What it says to me is there's something the governor and his team wants to hide."